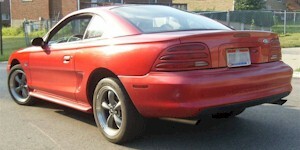 1995 Ford built a stripped down version of their Mustang GT in 1995. It was called the GTS. The GTS named option was only available in 1995. It continued as the 248A package through 1998. The GTS was a the powertrain of a GT with the characteristics of the Base V6 model. They came without spoilers or fog lamps. They had the same interior as the V6 except for the instruments. They did have the GT badging on the fenders and embossed into the rear bumper. A total of 6370 units were built in 1995.